Kindergarten can be very different from anything your child has ever experienced before. The thought of the unknown can make kids feel anxious and unsure about starting school. While there will always be some level of nervousness when faced with a change, there are things you can do to ease anxiety and help calm fears about school. Discuss what fears he or she may have about school. This sounds simple, but can be overlooked. It’s easy to assume what things about starting school are making a child nervous, but what seems scary to adults isn’t always the same thing that is scary to a child. Find out what your child is worried about. Make sure that your child knows that everyone feels nervous sometimes and it’s okay to feel that way. Talk about how you were nervous on your first day of work or school and what you did about it. Use your story to share strategies that would work at school. Play is a wonderful tool for helping to set expectations, manage fears, and gain a sense of confidence about school. It’s also just plain fun! Act out possible situations and model how to do things like ask a new friend to play, raise your hand, and ask to go to the bathroom. Pretend to do the things that teachers do at the beginning of the year, like pre-tests or assessments. When your child is confronted with a similar situation in school he will feel confident instead of nervous. 4. Visit the new school and classroom. When a child can start to see and imagine himself at school he can start to feel more confident about going to school. If you haven’t already taken a tour of the school arrange to stop by and see it. Walk around, take pictures, talk about the types of things that will happen in each area. After you are home sit down and create your own mini-book about school to read. 5. Read books about school. Books are fantastic for helping kids deal with change. Go to the library or bookstore and find books about beginning kindergarten, going to school, making friends, or whatever your child is nervous about. Even kids who aren’t worried will benefit from reading about going to school. 6. Write a letter to the teacher. Once you find out who the kindergarten teacher will be ask your child if he wants to write her a letter or draw her a picture. The child can ask the teacher questions and tell her a little bit himself. Writing a letter will help your child connect with the teacher. 7. Host a play date. Invite other kids over who are in the class or go to the school. Let your child get to know some of his classmates better so that the idea of kindergarten is more fun. You don’t need to plan anything huge, even a meet up at the park gives kids a chance to talk and play together. 8. Develop a goodbye routine. Kids do better when they know what to expect and transition times can be tough. Help ease the stress of goodbyes by rehearsing and planning what you both will do. Tell your child what you are going to do when you take him to school or the bus stop, for example, walk him to the door give him a hug and say see you later alligator. That way during the craziness of the first week of school you both will know exactly how that transition will go. 9. Send in a comfort object. Having comfort object from home can help kids who are anxious about being in a new place, just make sure to follow school rules when choosing something to send in. A family photo in the backpack, a special bracelet, or a handwritten note can all help make the day easier for students. It’s sometimes for parents to deal with the thought of sending their child off to kindergarten. 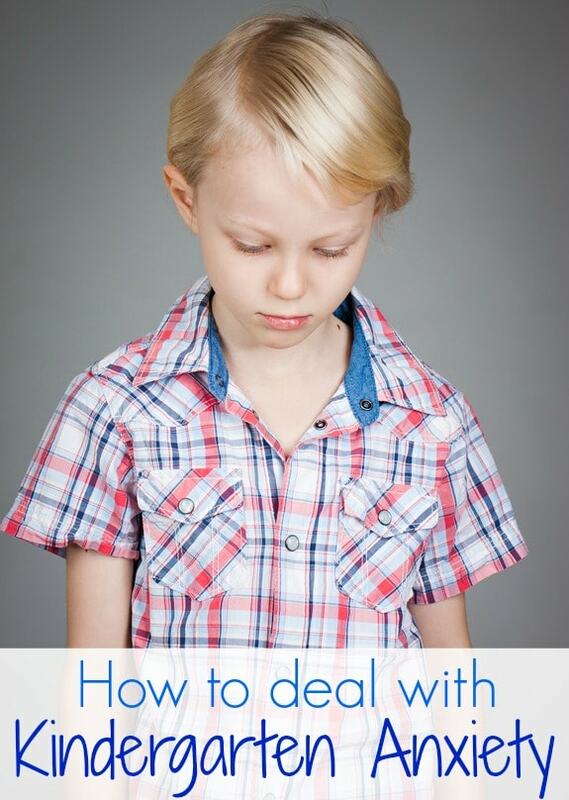 Make sure your anxieties and feelings aren’t rubbing off on your child. Talk to friends about how you feel and do your best to maintain a calm and confident manner around your child so he doesn’t get the idea that school is something for him to be worried about. Starting school can take awhile for some kids to get used to. Don’t worry if it takes your child more time to adjust than his friends. All kids handle changes differently. Keep the teacher informed of any concerns and involve the guidance counselor or your pediatrician if necessary.